Presented here, a fine Country Tin Domed Top Box on a dark Asphaltum (Japanned) background that has considerably darkened with age. Asphaltum is a refined form of the petroleum derivative asphalt. It is mixed with a varnish medium and used as a background coating. Being semi-transparent, it produces an amber color when applied to shiny tin. It darkens considerably with age. 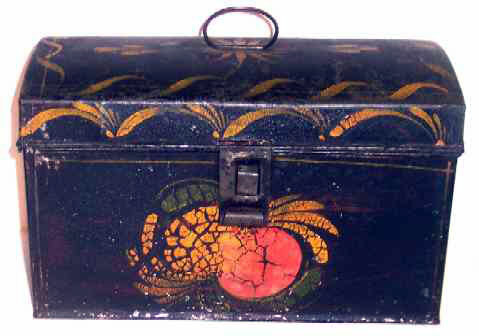 The Box is decorated on three sides as well as on the top and striping as well a bold large "S" strokes decorate the lid. The decoration strongly resembles the output of the Butler Shop in Greenville, NY but also has strong Berlin, CT influences which would not be surprising since Aaron Butler apprenticed in Berlin. Size is 8-1/2" long x 4-1/2" wide x 5-1/2" high and is in very fine condition with a heavily alligatored surface, especially on the front.